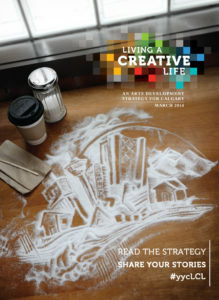 After close to two years of consultation, Calgarians’ vision for the arts coalesced into five major focus areas: Creative Communities, Centre City Arts District, Arts Incubation, Artistic Exchange, and Youth & Education. Focus Area: Each of five major goals that will contribute to Living a Creative Life’s overarching vision. Each focus area is broken down into a vision, outcomes, drivers and tactics. Vision: The aspirational description of what Calgarians would like their city to look like, as it pertains to the focus area. Outcome: The state or condition that does not currently exist but must exist in order to achieve the vision. Driver: A movement coordinated by various stakeholders to help achieve the outcome. Tactic: A single program, task or initiative that contributes to the driver. This strategy outlines the visions, outcomes and drivers of each of the five focus areas. Tactics for each driver are detailed in separate tactical plans, which will be updated annually and made available online. These plans will summarize the work currently being undertaken in support of the focus area, the activities of relevant signatories, as well as report on results as time progresses. The focus area overviews also include the success indicators that will provide evidence of progress for each outcome and focus area. The success indicators are systems-level measurements that will be evaluated on an annual basis to assess whether the strategy is achieving its goals and having impact in our city. Each success indicator is attached to a number of specific measurements (e.g., the number of Calgary youth attending arts events each year) that will be detailed and reported on in each focus area’s tactical plan.